Location of Douglas in Converse County, Wyoming. Douglas is a city in Converse County, Wyoming, United States. The population was 6,120 at the 2010 census. It is the county seat of Converse County  and the home of the Wyoming State Fair. Its former railroad passenger depot is listed on the National Register of Historic Places. Douglas was platted in 1886  when the Wyoming Central Railway (later the Chicago and North Western Transportation Company) established a railway station; the settlement had been in existence since 1867 when Fort Fetterman was built and was first known as "Tent City"  before it was officially named "Douglas", after Senator Stephen A. Douglas. It served as a supply point, warehousing and retail, for surrounding cattle ranches, as well as servicing railway crews, cowboys and the troops of the U.S. Army stationed at Fort Fetterman. Douglas was the home of a World War II internment camp. Douglas has a semi-arid climate ( Köppen climate classification BSk). As of the census  of 2010, there were 6,120 people, 2,546 households, and 1,613 families residing in the city. The population density was 1,336.2 inhabitants per square mile (515.9/km2). There were 2,788 housing units at an average density of 608.7 per square mile (235.0/km2). The racial makeup of the city was 94.4% White, 0.3% African American, 0.8% Native American, 0.2% Asian, 2.2% from other races, and 2.0% from two or more races. Hispanic or Latino of any race were 7.6% of the population. There were 2,546 households of which 34.6% had children under the age of 18 living with them, 47.7% were married couples living together, 10.3% had a female householder with no husband present, 5.4% had a male householder with no wife present, and 36.6% were non-families. 30.7% of all households were made up of individuals and 9.8% had someone living alone who was 65 years of age or older. The average household size was 2.37 and the average family size was 2.98. The median age in the city was 35 years. 27.7% of residents were under the age of 18; 8.2% were between the ages of 18 and 24; 27.5% were from 25 to 44; 25.8% were from 45 to 64; and 10.8% were 65 years of age or older. The gender makeup of the city was 50.0% male and 50.0% female. As of the census  of 2000, there were 5,288 people, 2,118 households, and 1,423 families residing in the city. The population density was 1,035.0 people per square mile (399.6/km²). There were 2,385 housing units at an average density of 466.8 per square mile (180.2/km²). The racial makeup of the city was 94.12% White, 0.06% African American, 0.78% Native American, 0.13% Asian, 0.02% Pacific Islander, 3.63% from other races, and 1.27% from two or more races. Hispanic or Latino of any race were 6.64% of the population. There were 2,118 households out of which 36.6% had children under the age of 18 living with them, 53.7% were married couples living together, 10.0% had a female householder with no husband present, and 32.8% were non-families. 28.7% of all households were made up of individuals and 11.5% had someone living alone who was 65 years of age or older. The average household size was 2.45 and the average family size was 3.04. In the city, the population was spread out with 28.5% under the age of 18, 8.0% from 18 to 24, 29.8% from 25 to 44, 21.8% from 45 to 64, and 11.9% who were 65 years of age or older. The median age was 35 years. For every 100 females, there were 94.4 males. For every 100 females age 18 and over, there were 91.5 males. The median income for a household in the city was $36,944, and the median income for a family was $44,900. Males had a median income of $36,489 versus $18,662 for females. The per capita income for the city was $17,634. About 11.9% of families and 14.1% of the population were below the poverty line, including 19.6% of those under age 18 and 14.7% of those age 65 or over. Public education in the city of Douglas is provided by Converse County School District #1. Zoned campuses include Douglas Primary School (grades k-1), Douglas Intermediate School (grades 2-3), Douglas Upper Elementary School (grades 4-5), Douglas Middle School (grades 6-8), Douglas High school(grades 9-12). Douglas is also home to the branch campus of Eastern Wyoming College, one of the state's seven community colleges. Douglas is located on the banks of the North Platte River, and is named for Stephen A. Douglas, U.S. Senator. The city grew after it was designated a stop on the Fremont, Elkhorn and Missouri Valley Railroad. Railroads brought settlers and pioneers west; some stayed and others continued on. Douglas' location affords excellent access to nearby sights. Medicine Bow National Forest is located nearby, as is Thunder Basin National Grassland and Ayres Natural Bridge. In 1996 Douglas was listed by Norman Crampton as one of The 100 Best Small Towns in America. Since Fort Fetterman days, Douglas has been a center of American horse culture. The remains of the first winner of American racing's Triple Crown, thoroughbred Sir Barton, are buried here. Today, Douglas is the location of the Wyoming State Fair, held every summer and known for its rodeo and animal competitions. Also on the fairgrounds is the Wyoming Pioneer Memorial Museum, a collection of pioneer and Native American relics pertaining to the history of Converse County. In 1932, the jackalope legend in the United States was attributed by The New York Times to Douglas Herrick (1920−2003) of Douglas, and thus the city was named the "Home of the Jackalope" by the state of Wyoming in 1985. Douglas has issued Jackalope Hunting licenses to tourists. The tags are good for hunting during official Jackalope season, which occurs for only one day, June 31. I-25 North-South Interstate running from New Mexico to Wyoming; runs concurrent with US 87 through Douglas. Air service is available 58 miles west of Douglas at Casper/Natrona County International Airport. The airport is located west of Casper, just off of US Highway 26. Passenger flights are offered by United Express ( SkyWest Airlines), Delta Connection (SkyWest Airlines), and Allegiant Airlines. 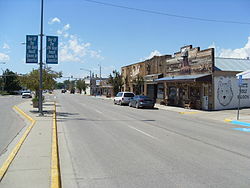 ^ "Profile for Douglas, Wyoming". ePodunk. Retrieved 2010-05-28. ^ "Monthly Averages for Douglas, WY". The Weather Channel. Retrieved January 13, 2011. ^ Fremont, Elkhorn & Missouri Valley Railroad Passenger Depot in Douglas, Wyoming. Wyoming State Historic Preservation Office. Includes a photograph. ^ a b "Wyoming state fair grows its crowds". Wyoming Tribune-Eagle. Retrieved August 10, 2013. ^ Maintenance Staff (February 15, 2013). "2013 Maintenance Section Reference Book" (PDF). Wyoming Department of Transportation. Retrieved September 17, 2014. ^ Google (September 22, 2014). "Overview of I-25 Bus. in Douglas" (Map). Google Maps. Google. Retrieved September 22, 2014. 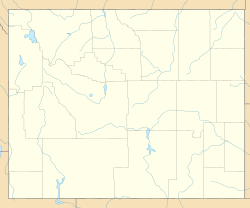 Wikimedia Commons has media related to Douglas, Wyoming.